The strawberry red flower with a white heart is especially striking. A great plant for attracting butterflies and hummingbirds, as the flowers produce nectar Like all passionflowers, Lady Margaret needs to be placed in a sunny spot It is suitable for indoor and outdoor use The starter plant you will receive is growing in a 3" pot. 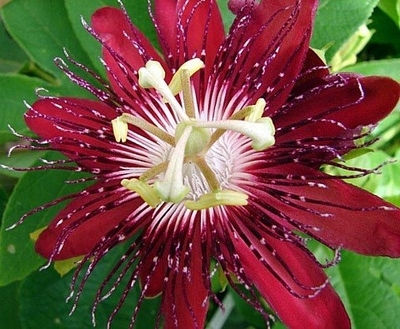 Lady Margaret is a new, profusely flowering Passiflora for indoors and outdoors. The strawberry red flower with a white heart is especially striking. This colouring for a Passion Flower is rare - most are sky-blue or pale purple. Whilst red ones have been available for a long time, this combination is unique. Passiflora Lady Margaret is a hybrid, created by crossing P. coccinea and P. incarnata. It is suitable for indoor and outdoor use. Like all passionflowers, Lady Margaret needs to be placed in a sunny spot. In the house it can flower all the year round, but in the garden, patio or balcony, it flowers until late autumn. A great plant for attracting butterflies and hummingbirds, as the flowers produce nectar. The starter plant you will receive is growing in a 3" pot.